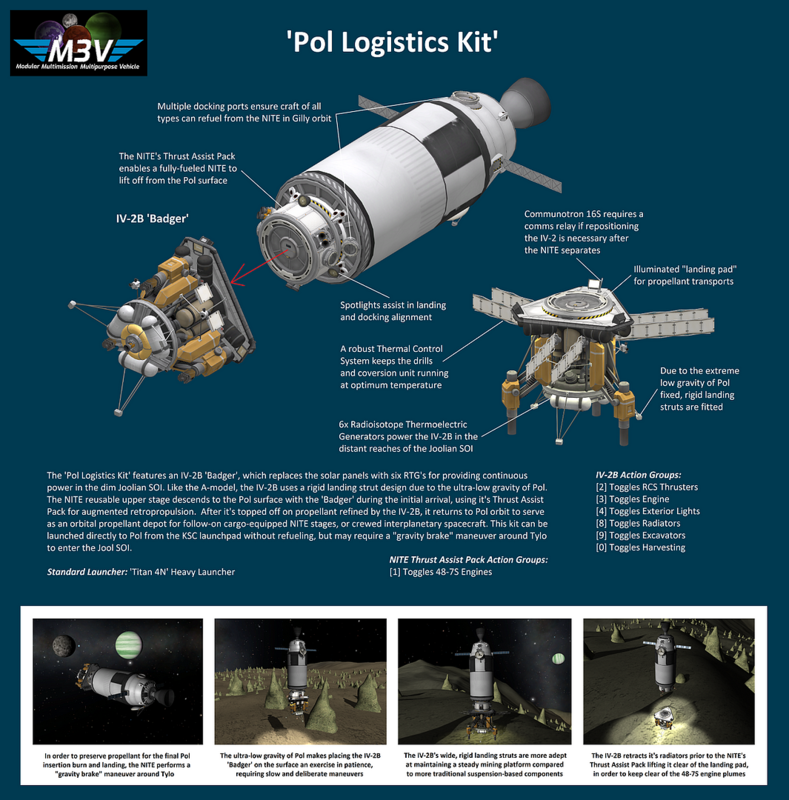 The ‘Pol Logistics Kit’ features an IV-2B ‘Badger’, which replaces the solar panels with six RTG’s for providing continuous power in the dim Joolian SOI. Like the A-model, the IV-2B uses a rigid landing strut design due to the ultra-low gravity of Pol. The NITE reusable upper stage descends to the Pol surface with the ‘Badger’ during the initial arrival, using it’s Thrust Assist Pack for augmented retropropulsion. After it’s topped off on propellant refined by the IV-2B, it returns to Pol orbit to serve as an orbital propellant depot for follow-on cargo-equipped NITE stages, or crewed interplanetary spacecraft. This kit can be launched directly to Pol from the KSC launchpad without refueling, but may require a gravity brake maneuver around Tylo to enter the Jool SOI. Built in the VAB in KSP version 1.6.1.